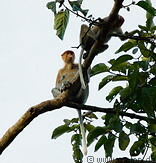 The lower Kinabatangan river area is full of wildlife relatively easy to see because the animals live all close to the river and the village of Sukau lies deeply in the protected area. Species found in the area are orangutans, proboscis monkeys, macaques, gibbons, hornbills, Sumatran rhinoceros and Borneo pygmy elephants. Borneo pygmy elephants are a subspecies of the Asian elephant found only in northern Borneo. According to estimates there are only about 1000 Borneo pygmy elephants left in the wild.